Summit brings quality and value under the counter with the industry's largest collection of ADA compliant built-in refrigeration. 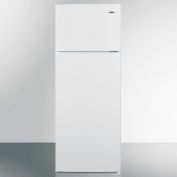 The CT661BIADA Series features residential refrigerator-freezers made in Europe and designed for reliable cold storage under lower ADA counters. 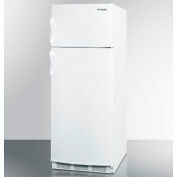 Sized with a 24" footprint, the CT661BISSHVADA refrigerator-freezer offers a generous 5.1 cu. 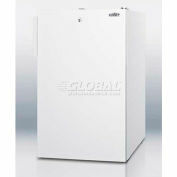 ft. storage capacity, larger than many units in this size class. The 32" height and front-breathing design makes it ideal for installation under lower counters complying with ADA guidelines for height restriction. 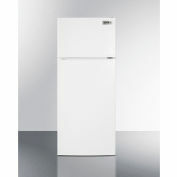 The fully finished cabinet also enables freestanding use. 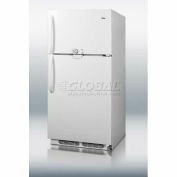 This unit comes with a white cabinet and stainless steel wrapped door. A sleek stainless steel handle completes the professional look. 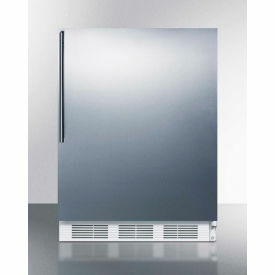 Inside, the CT661BISSHVADA features a dual evaporator to allow separated cooling of the fresh and frozen food sections. 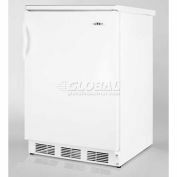 The refrigerated compartment utilizes low maintenance automatic defrost, while the interior freezer compartment is manual defrost to achieve lower storage temperatures ideal for ice cream and other frozen food. The deluxe interior includes adjustable glass shelves for spill-proof storage and easier cleaning, as well as a scalloped wine shelf to hold wine and champagne bottles safely in place. 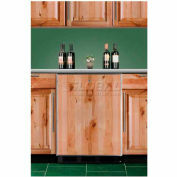 Door racks offer additional convenience for tall bottles and condiments and a clear crisper drawer ensures your produce is stored under the ideal conditions. These models include automatic interior lighting and an adjustable dial thermostat. 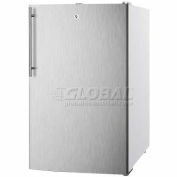 With its ideal dimensions and user-friendly features, the CT661BISSHVADA is the perfect refrigerator-freezer for any ADA compliant setting in need of versatile storage under the counter. 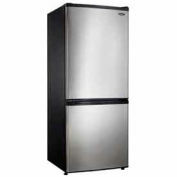 For this unit with a black cabinet finish, see the CT663BBISSHVADA. Summit CP133 - 2 Door Refrigerator-Freezer, Cycle Defrost, Slim 24"W, 9.5 Cu.Ft.